Published: Oct. 11, 2012 at 06:25 p.m. 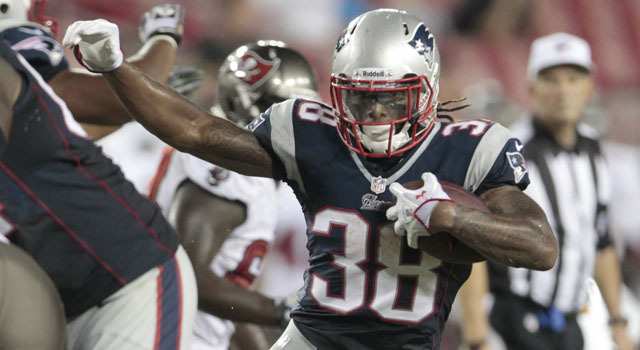 Updated: Oct. 12, 2012 at 12:01 a.m.
Undrafted free-agent rookie Brandon Bolden averages a robust 5.6 yards per carry for the New England Patriots. The New England Patriots continue to field one of the NFL's most explosive offenses, but the unit has undergone an extensive makeover at the hands of Bill Belichick. Rather than rely on the pass-first premise that fueled a pair of Super Bowl runs from 2007 to 2011, the offense has returned to the diversified approach built upon a power running game that helped the team capture three Lombardi Trophies in the 2000s. New England currently ranks third in the NFL with 165.4 rushing yards per game. 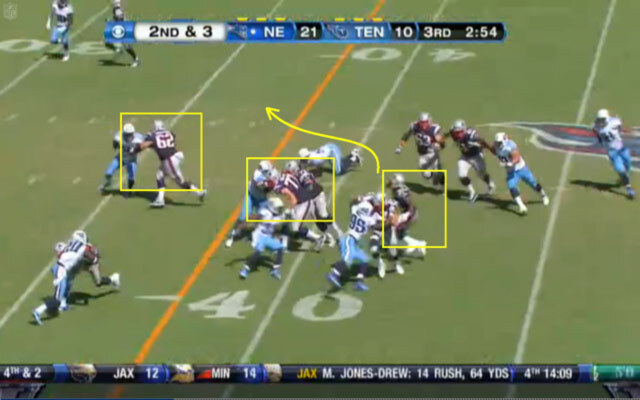 1) The Patriots' no-huddle tempo makes the defense susceptible to the run. 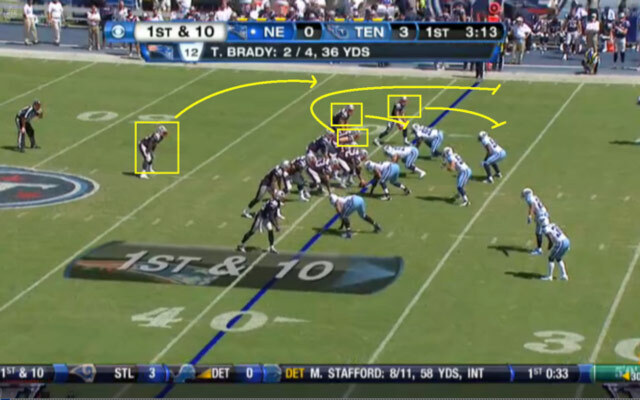 The Patriots are tormenting opponents with a no-huddle offense that operates at a frenetic pace. 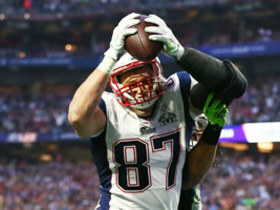 Tom Brady routinely fields the snap within 15 seconds of the ball being set by the referee to limit the defense's ability to substitute, significantly fatiguing the opposition over the course of the drive. This results in defenders losing their will to fight off blocks at the line of scrimmage, leading to huge gains by runners throughout the game. 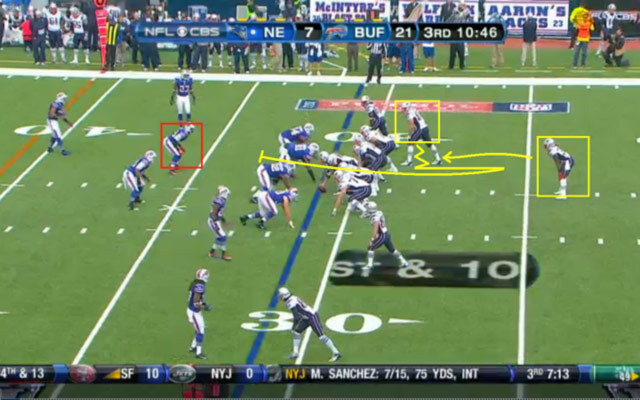 In addition, the Patriots' hurry-up approach has led to alignment problems and communication issues from the defense. In watching tape of the Patriots' last two games, I was surprised at the number of times the defense failed to properly align against the formation. 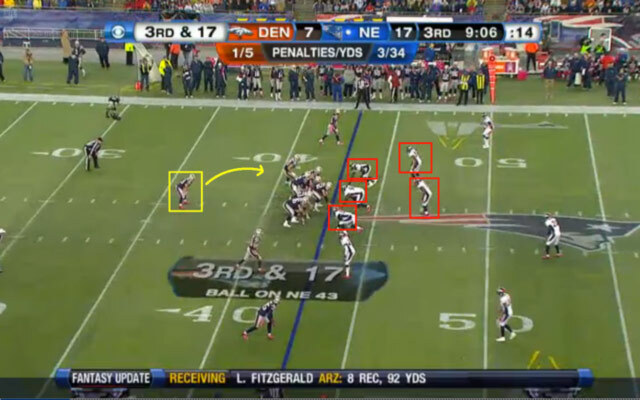 Defenders were repeatedly out of position when the ball was snapped, and New England exploited the vulnerabilities by running to those areas. The Patriots' use of the no-huddle has also forced defensive coordinators to scale back their blitzes due to concerns about communication between defenders. Defensive play callers are typically reluctant to bring five- and six-man blitzes with man coverage in the back end for fear of a blown coverage resulting in an easy score. Consequently, they sit back in a basic defense and hope that their defenders are able to contain the run without assistance of scheming or trickery. This is difficult to achieve at any level of football, particularly in the NFL when extra defenders are needed near the line of scrimmage to stop powerful ground games. With the Patriots able to limit those tactics through a no-huddle approach, the productivity of their rushing game has improved significantly in 2012. 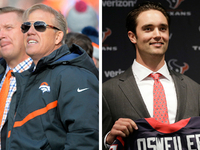 2) Josh McDaniels is maximizing the talents of a versatile backfield rotation. 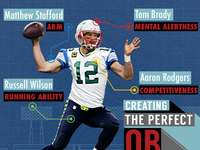 The biggest job of an offensive coordinator is to fully utilize the talents of the team's top players. Although this premise sounds simple, it can be a tough task for offensive architects unwilling to tweak their scheme. In New England, though, McDaniels has done a great job of tailoring his system to the strengths of his players, particularly his running backs. 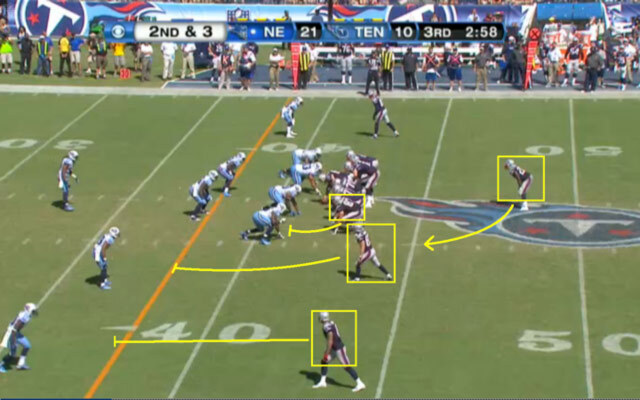 As I closely studied the Patriots' offense, I noticed that all of their runners appear to have a package of running plays that ideally fit their running styles. For instance, Stevan Ridley is a tough, physical runner with good speed and quickness, so he repeatedly runs perimeter plays like toss sweeps and stretches to take advantage of his explosiveness and burst. While he is also effective running between the tackles on various zone runs, it appears the Patriots make a concerted effort to get him the ball off tackle. The play is perfectly executed and Ridley picks up a 20-yard gain. The play is blocked well and Ridley picks up 17 yards and a first down. The Patriots pick up 15 yards and a first down on the play. Brandon Bolden is a punishing downhill runner with outstanding strength and power. He routinely runs through arm tackles at the point of attack, and displays the kind of tenacity that coaches covet in inside runners. 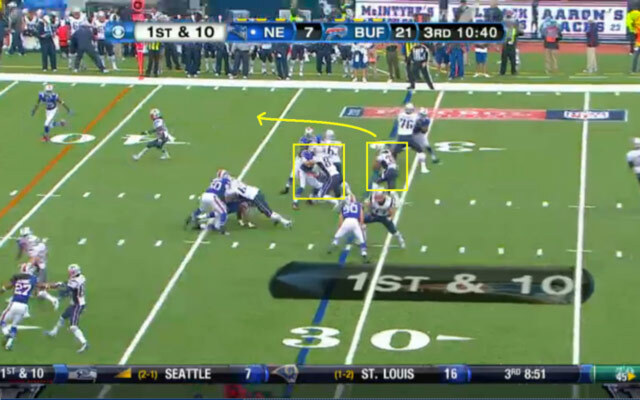 The Patriots take advantage of his skills by running him on a variety of inside zones and counters that enable him to hit the hole with his shoulders square to the line. As a result, he is always moving north-south, and rarely loses yardage when he touches the ball. 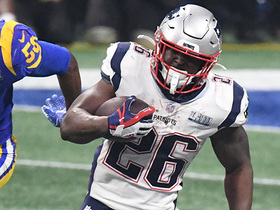 Bolden's average of 5.6 yards per carry leads the Patriots and ranks among the highest totals for a runner with 30-plus carries. This results in a 20-yard gain for the Pats. 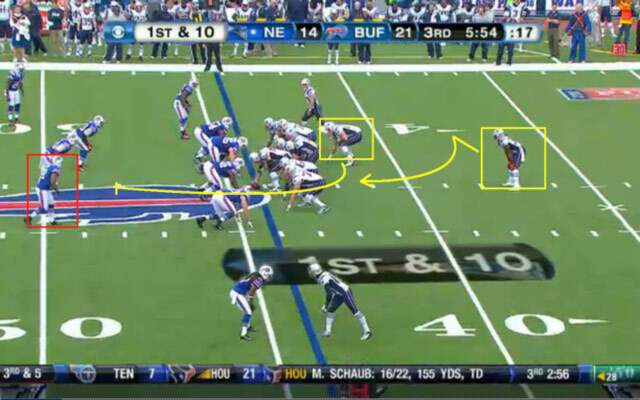 Thanks to Gronk's key block, Bolden squirts free for 27 yards. Danny Woodhead is the Patriots' top multi-purpose weapon out of the backfield. He is so productive as a receiver that opponents react by putting nickel or dime personnel on the field to neutralize his effectiveness against linebackers and safeties. 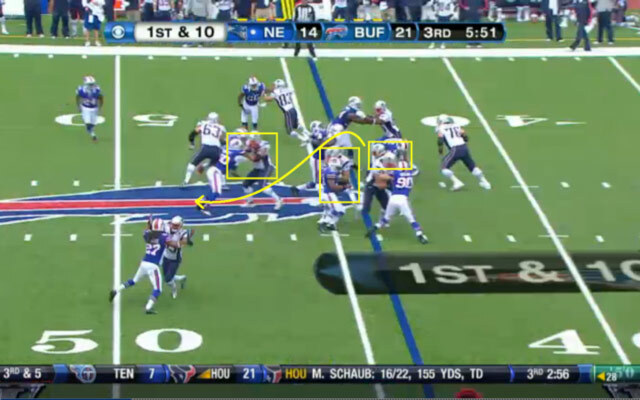 The Patriots' exploit this tactic by routinely running Woodhead on draws and delays, taking full advantage of the "light" boxes at the point of attack. 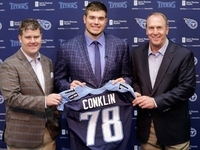 (Defensive coordinators will outnumber offenses at the line of scrimmage to stop the run, but remove defenders when a pass is expected to improve coverage.) With fewer bodies to defend against downhill runs, New England likes to slip the ball quickly to Woodhead and allow him to use his quickness and cutback ability to explode through seams. 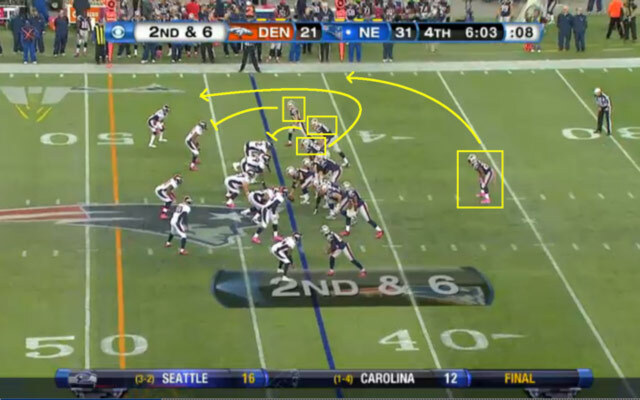 When joined on the field by Aaron Hernandez, Gronkowski, Brandon Lloyd and Welker, the threat of the pass creates big-play opportunities on deceptive runs. The result? An easy 19 yards against a light box. 3) The re-establishment of the power running game makes the Patriots' offense more difficult to defend in postseason play. Given the copycat nature of the NFL, the Patriots needed to come up with an effective counter to those tactics or encounter similar issues against any playoff foe. Establishing a strong running game is the most effective way to get opponents out of two-deep coverage. 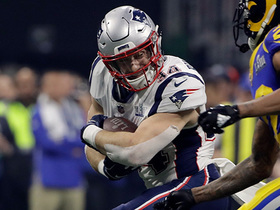 By pounding the ball successfully between the tackles, New England will force opponents to add another defender to the box, creating single coverage on the outside for Brady to target. 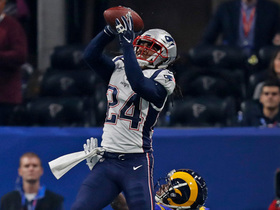 This will help Lloyd, Welker and Deion Branch catch more passes outside the numbers, and free up Hernandez and Gronkowski between the hashes on intermediate routes. 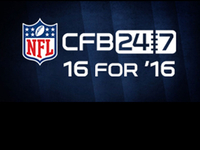 In addition, it will set up big-play opportunities in the passing game off play action. When you review Brady's longest completions this season, a majority of them were the byproduct of defenders being fooled on play fakes in the backfield. With a powerful running game commanding respect and attention, the Pats suddenly have a balanced attack that is problematic for defensive coordinators around the league.